Glaro: Fine Metal Hospitality and Hotel Furnishings. Glaro the Finest Public Furnishings Available at some of the best or lowest prices on the web. 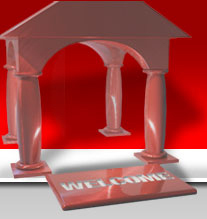 We Carry Every Product that Glaro Makes, Even if it does not appear on our web site yet. We Also Carry Replacement Parts for Glaro Products, Please Email Us with Your Request. All Online Orders are Processed Securely Through PayPal. We Also Accept Credit Card Orders Via Phone, Fax and Email. We will contact you with shipping charges before payment is applied to your credit card. To Pay by Check, Please Email Us for a Quote that will Include all Shipping Charges, before you send a payment. MyHospitalityAgent.com offers the COMPLETE line of Glaro Products and ONLY Glaro Products. If you are looking for Hotel Supplies, Restaurant Supplies, Lobby Furnishing, Office Furnishing, Site Furnishing or Hospitality Products made by Glaro, they are available online at MyHospitalityAgent.com with major discounts. Glaro Textured Finish, Designer Trash Receptacles Glaro Extenda-Barrier Retractable Strap Crowd Control Posts and Public Guidance Systems, are an exceptional value and extremely durable crowd control product. 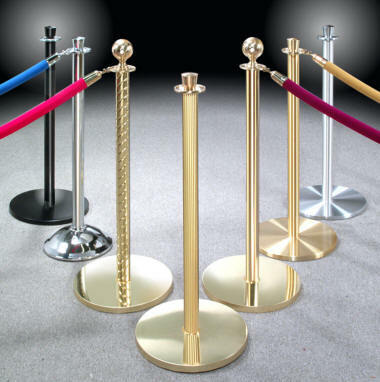 Glaro Extenda-Barrier systems create Crowd Control Barriers as well as Security and Safety Barriers. Visit the Glaro Extenda-Barrier Crowd Control page for details. If you prefer the Elegance of Traditional, Classic Posts and Ropes, visit our huge selection on our Posts and Ropes page. For Luxurious Classic Ropes please visit the Traditional Rope page. The Glaro "All Weather" Satin Brass Trash Receptacles and Satin Aluminum Waste Receptacles are second to none for Fire Safety and Durability. The Elegant Banded Trash Receptacles cannot be considered typical garbage cans, as their appearance indicates that you care about the finer details of your establishment. The the Revolutionary Glaro Glider Six Wheel Bellman Carts not only obtains precision, pinpoint maneuverability not available on conventional luggage carts, it also instills confidence in your guest because it shows that you care about their belongings. The Glaro Regal series of Hotel Carts are designed to coordinate perfectly with your decor as well. The upscale Cigarette Receptacles, known by Glaro Dealers as The Smokers Post, offers your visitors a visually pleasing alternative to the "Genie Bottle" eyesore that is currently available from other manufacturers. The Glaro Garment Racks, Coat Racks, Coat Trees and Clothes Rack are all of Institutional Quality but designed to look good anywhere. Our Popular Umbrella Racks will help keep your floors dry and safe on rainy days Glaro Sign Frames and Sign Displays are solid and durable, designed to withstand the most demanding of public places. Check out the coordinating Metal Planters on the Satin Brass Trash Receptacles and Satin Aluminum Waste Receptacles pages.